As always, the economy’s fundamentals determine the stock market’s medium-long term outlook. Technicals determine the stock market’s short-medium term outlook. Here’s why the stock market could pullback for 1-2 weeks, but the medium term is bullish. Last week I wrote about Stock market’s downside is limited, medium-long term is bullish. Not much has changed about the U.S. economy – it is still improving at a decent pace. The economy and stock market move in the same direction in the medium-long term. A growing economy = medium-long term bullish for the stock market. 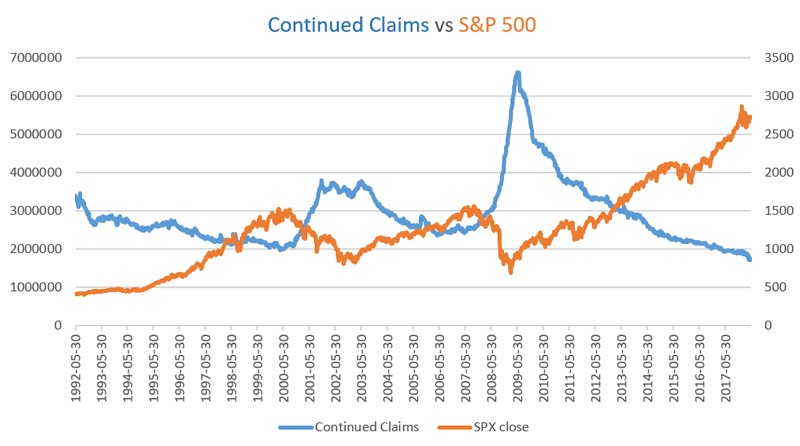 For starters, we can see that the current equities bull market and economic expansion don’t have many years left. Corporate Unit Profits have been down since late-2014. Corporate Unit Profits tend to peak in the middle of an economic expansion cycle. The economy is getting close to “full employment” (max potential), but is not quite there. There is still some room left to run. The Unemployment Rate – CPI tends to reach zero before a recession and equities bear market starts. The following indicators demonstrate that the economy has yet to deteriorate and is still improving, which means that the stock market’s bull market still has some room to run. Initial Claims and Continued Claims are still trending lower. Job Openings (JOLTS) are still trending higher. Notice how these 3 economic indicators lead the stock market. Heavy Truck Sales continue to trend higher. Another medium-long term bullish sign for the stock market and economy since this is a leading indicator. Foreign buyers are turning bullish on U.S. equities, but aren’t bullish enough. 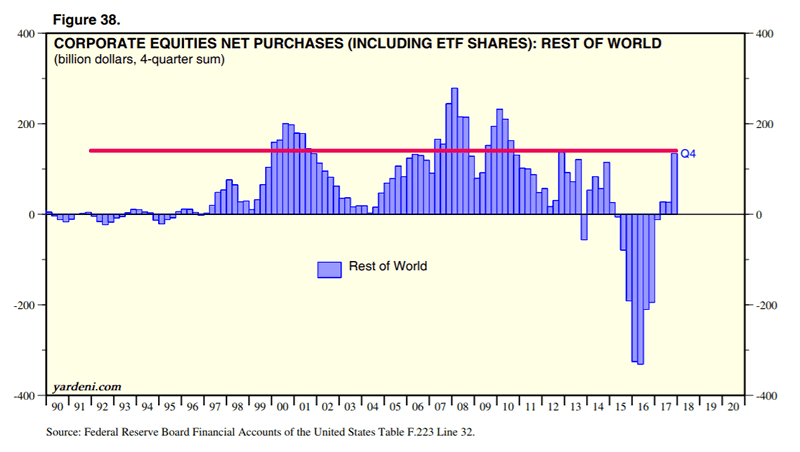 We typically see an explosion in foreign buying during the last few quarters of a bull market. Keep in mind that this data series is not adjusted for inflation, so nominal foreign buying this time should exceed previous peaks. Various studies that we did this week suggest that the stock market (S&P 500) will make new all-time highs in the coming months. 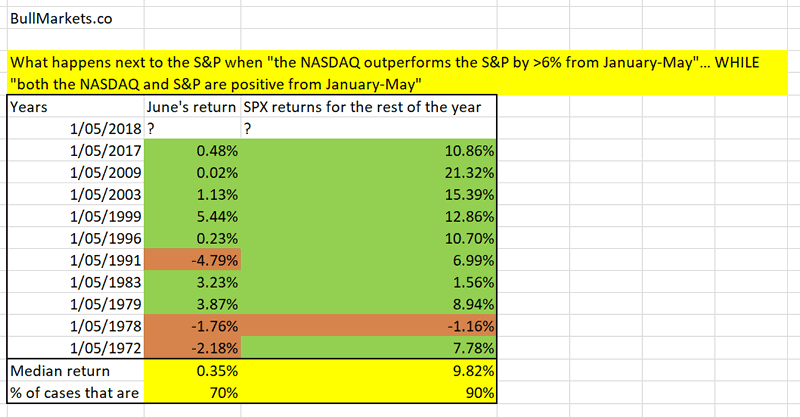 For starters, both the NASDAQ and Russell 2000 have massively outperformed the S&P 500 from January-May. This is historically a bullish sign for the S&P 500 from June-December (i.e. rest of the year). 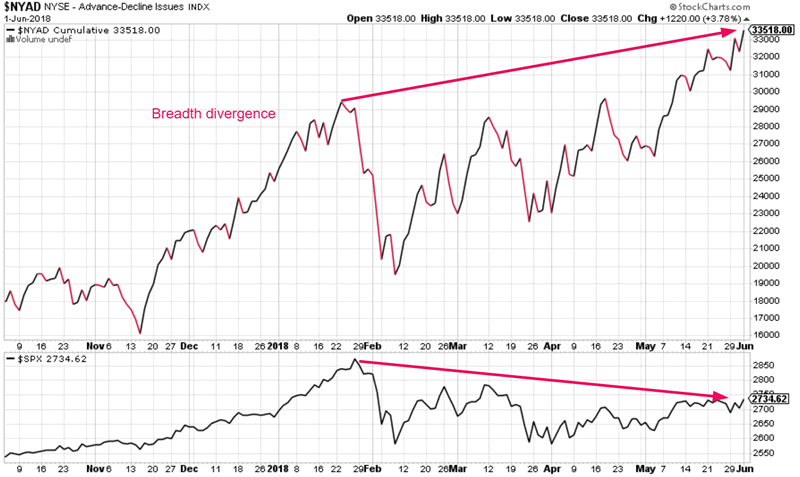 As a result, the cumulative A/D line continues to make a bullish breadth divergence with the S&P 500. VIX (volatility index) has done a roundtrip in the meantime, going from a very low level, to spiking in February 2018, back down to a very low level. 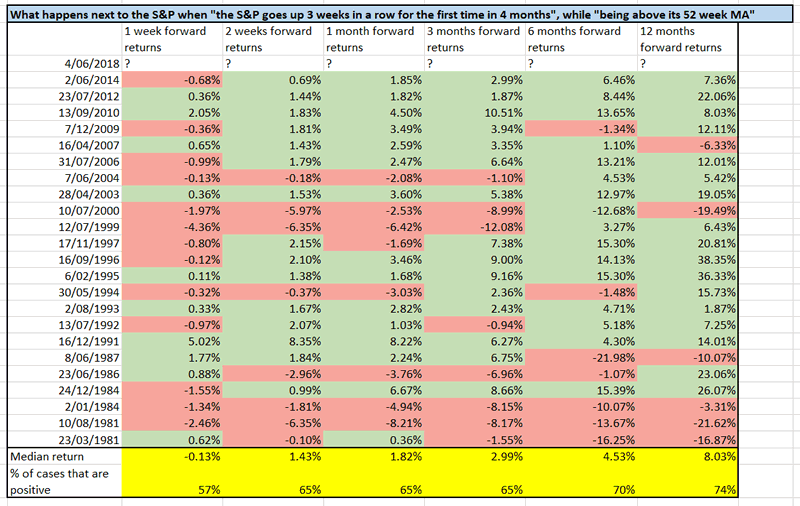 The forward returns 6 months later are mostly bullish, with 1 loss being very small (-0.87%). And lastly, the Fed is expected to hike interest rates next week. The stock market tends to go up while the Fed is hiking interest rates. The stock market usually goes up for a few months after the Fed stops hiking interest rates. Next Wednesday’s rate hike will not be the last in this rate hike cycle. 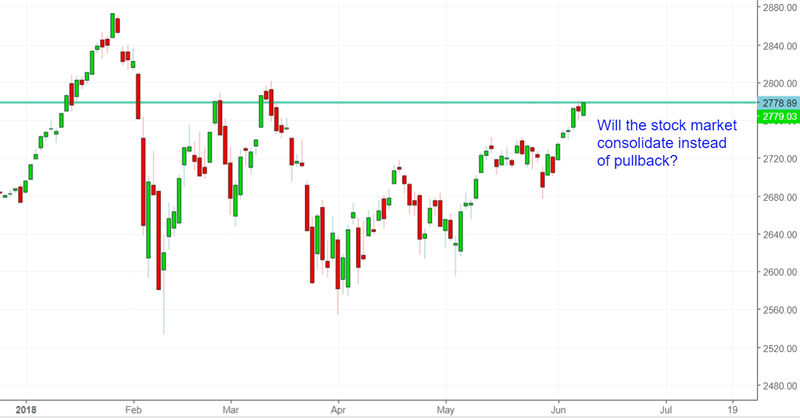 The stock market’s short term (i.e. next 1-2 weeks) leans towards the bearish side. For starters, the stock market has not reacted bullishly in the short term to rate hikes in the current rate hike cycle. This bearish edge goes away after 1 month. And as mentioned, VIX is rather subdued right now, which makes a short term pop in VIX and short term decline in the S&P 500 possible. See 2 weeks forward returns for the S&P. In addition, the stock market has gone up 3 weeks in a row. 1 week forward returns are worse than random (random = up on 60% of random weeks). Keep in mind that the stock market can play out a “short term bearish” scenario using a consolidation instead of a pullback. I like to focus on the medium-long term. Getting the medium-long term right isn’t hard. But I’ve seen plenty of cases in which the short term leaned bearish but the stock market kept on going up. The stock market has a natural bullish bias – it goes up more often than it goes down. Bears have a statistical disadvantage in the stock market.